I wish there was a strong way to associate Robocop and TikGames’ recent Xbox Live Arcade release, Interpol: The Trail of Dr. Chaos. The simple route would consist of me telling you that Interpol has detectives. Then I would draw a rough comparison between the gumshoe gameplay and how Robocop doesn’t need “clues” to catch the bad guy. Somehow, he always knew which cocaine factory door to kick in. I can’t fully draw this comparison. I think it would be a disservice to Alex Murphy, who gave up his undead life to protect the streets of Old Detroit. But I can review Interpol and pretend that Robocop has his metal hand over my shoulder the entire time. His essence would demand that I be factual. Above all else, his spirit would compel me to kick through Interpol’s cocaine door and reveal its honest truth. I shall do that after the break. Hit it. 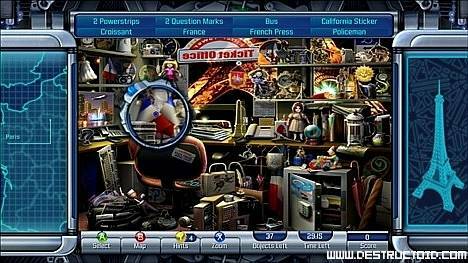 TikGames’ Interpol is the videogame equivalent of the Hidden Picture portion of Highlights magazine. It puts you in the role of an international detective, charged with defeating a global crime network starring a small cast of slippery lunatics. Don’t let your imagination get the best of you. Rather than actively searching the globe and putting together complex pieces of evidence, Interpol presents you with a series of geographically-themed hidden item puzzles. 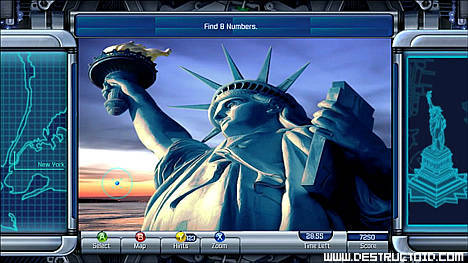 The puzzles are presented as blurry, VGA-inspired artwork. Various items clutter the foreground of an ultimately stereotypical and idiotic representation of the geographical area. The Louvre, for example, is a closet shot of a disheveled basement. The Mona Lisa sits on the floor behind a giant model of a scorpion. The Last Supper is on a shelf, shoved underneath a giant samurai sword. 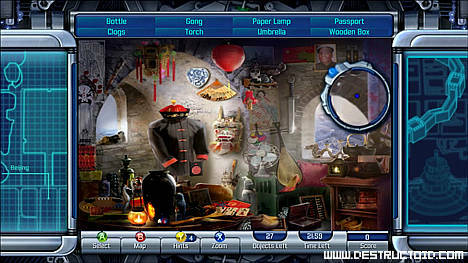 Items like ornate knives, maces, and even a bust of a Pharaoh are strewn throughout the picture as nothing more than clutter. Most of the items that you are told to find have zero meaning. The text-based narrative informs you that you are seeking some of the world’s most slippery criminals. I fail to understand how finding a bookmark, snake, and a model ship in the Vatican Library puts me on the trail to finding Dr. Chaos, or how it could lead the detective to search a restaurant kitchen or the Coliseum. Once a ridiculous object is found in the picture, a simple click from your cursor suffices. The ephemeron then magically disappears and gives you points -- points that lack meaning, just like what you found. The cursor is small enough to avoid getting in your way and also has a magnifying property. A lot of the items in the game are fairly small and require this solution. There’s a problem, though. The art is so poorly rendered that it is hard to ascertain what an object is and what is merely background detail. The most impressive thing in Interpol is the revolving globe shown while the game is loading. It is 3D and spins on a perfect axis. It has a bright, neon glow and looks as if it was created within the last four years. The narrative is told through little blocks of text between missions. After beating a geographic area’s three- to four-puzzle pictures (within a time limit that is insanely high), the narrator informs you that it’s time to find another bad guy connected to Dr. Chaos. It cuts to a map, draws a neon line, and you’re magically there with an option of picking between three different locations. It is not exciting, interesting, or compelling. Interpol has a cooperative multiplayer mode (both local and over Xbox Live), but it is nothing more than a rehash of the single-player mode -- with four people. Because the areas recycle objects or have a limited quantity of stuff to find, these missions can be beaten in a matter of 1-2 minutes. Also, having four cursors on the screen is quite annoying and it is easy to get lost in the shuffle. To the game’s credit, there are bonus missions, and if you choose to go back into a geographic area -- I’m not sure why you would -- there will be new objects to find. Unfortunately, the picture stays the same way it did the first time you went through it. Hell, you probably remember that pen behind the blue vial and can find it immediately, anyway. Interpol is a bad videogame. I can see where a minute bit of fun could come out of it. Finding hidden objects is a delightful activity for children, but there is no tangible value for anyone looking to play a game. Interpol is as shallow as the artist who decided that the Mona Lisa could sit on the floor behind a model scorpion. The visuals are terrible, the narrative is poor, and the multiplayer is rendered pointless by the game’s regurgitated assets and unchanging artwork. Stay away from this.